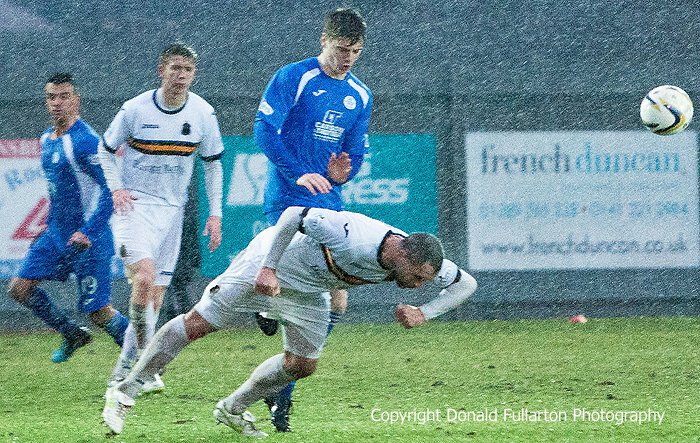 A GUTSY performance by Dumbarton earned them a point against play-off challengers Queen of the South at the rain-drenched Dumbarton Football Stadium. A GUTSY performance by Dumbarton earned them a point against play-off challengers Queen of the South at the rain-drenched Dumbarton Football Stadium in front of a 904 crowd. The dreadful conditions undoubtedly spoiled the contest with the visitors struggling with their normal passing game and the home side concentrating on defence. There were few chances in the first half, though Ian McShane hit woodwork for the visitors and Scott Agnew and Mark Gilhaney had long range efforts saved. Dumbarton became more of an attacking force in the second half, with Archie Campbell, Gilhaney and skipper Andy Graham all coming close. At the other end keeper Danny Rogers was in top form, making some vital saves. The visitors frustration grew, and Derek Lyle was red-carded for a needless foul on Campbell. On loan striker Chris Duggan from Partick Thistle made home debut and took a little time to settle, but then came more and more into the game. The photo shows man of the match Chris Turner stooping to head clear.